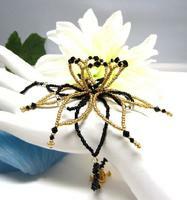 Your hand will glitter and gleam through all dark shadows when you wear this elegant night flower slave bracelet. The graceful beaded night flower rests on the back of your hand and illuminates it with jet black, crystal aurora boreale and luminous green Swarovski crystals; and black and gold metallic seed beads. The three dimensionality of the night flower gives the slave bracelet a light and airy quality. The slave bracelet closes comfortably with a gold plated toggle clasp. The slave bracelet is so incredibly feminine, so incredibly mysterious, so incredibly from Sparkle Plenty.